Is Delhi&#8217;s air quality worse off? Smokescreen? Key pollutants have perceptibly declined, making the debate much more nuanced than simply pointing a finger at the ever-rising number of vehicles on the Capital’s roads. Is Delhi’s air quality worse off? Has pollution in India’s Capital risen? While the anecdotal answer is likely to be a resounding yes, empirically, and as incredible as this may seem to visitors from other cities, such as Mumbai and Bangalore and those who live in Delhi, there is no definitive—and scientific—answer, one way or the other. This is because key pollutants, which potentially pose greater health hazards than some others, have risen sharply. But some key pollutants have perceptibly declined as well, making it a much more nuanced debate than simply pointing a finger at vehicles—especially diesel-fuelled ones. Between 2000 and 2006, data compiled by the Central Pollution Control Board (CPCB), the environment and forest ministry’s pollution monitoring arm, shows that in residential areas, the presence of sulphur dioxide (SO2) in the air has declined by nearly 50% and it is actually well within the norms that are considered safe. But aerosols, or suspended particulate matter (SPM), were well above the norms, and nitrogen dioxide (NO2) levels have accelerated by almost the same proportion. Meanwhile, levels of so-called respirable suspended particulate matter, much finer SPM particles often less than 2.5 micrometres, rose by 28.5% in 2006 from 125 to 160 microgram per cu. m, in residential areas of the Capital, says CPCB. The bigger concern is the escalating trend between August and October this year, with SPMs hitting 240 micrograms per cu. m.
Data such as this is what has prompted the likes of Sunita Narain, head of Centre for Science and Environment, an environmental activist group, to predict that 2007’s annual average will see a “substantial increase, almost to the pre-CNG (compressed natural gas) levels (before 2001), if current pollution trends continue". Narain is referring to the time when Delhi’s air quality was unanimously considered a nightmare and led to the government mandating that all buses and other commercial public transport, such as taxis and three-wheelers, use CNG instead of diesel or petrol. Despite significant media coverage in recent weeks about worsening air quality—often a staple of winter-time news coverage in the Capital, coupled with fog-related woes at the Delhi airport—as well as local politicians debating all sorts of ways to potentially clean up the air in the city, in the last six years, SO2 and carbon monoxide (CO), two lethal gases and principal components of exhaust from petrol vehicles, have sharply fallen in Delhi. This fall, according to experts, is due to the adoption of technologies such as the multi-point fuel injection system in vehicles, the three-way catalytic convertor, and an overall shift in?two-wheelers from two-stroke to four-stroke engines. Still, there is no single way of measuring the net impact of the two divergent trends, especially, since, unlike in say the US, there is no single air quality index for Delhi. “There’s no way, really, to say how many units of carbon monoxide is equivalent to a unit of suspended particulate matter," says Anil Singh, scientist at the Central Road Research Institute here. CPCB did toy with the idea of an index when it commissioned Mukesh Sharma, a professor at the Indian Institute of Technology (IIT) Kanpur, to do a pilot project and prepare an air quality index that could rate the Capital’s air quality as either good or poor on any given day. “We set up the database and all the data was accessible via a website," says Sharma. “But, it never went beyond being a pilot project." Indeed, the website, http://home.iitk.ac.in/~mukesh/ind-aqi/index.html, shows that the data hasn’t been updated since 2000. “Mukesh’s project was a test, and was largely based on the ways the United States Environmental Protection Agency (EPA) calculates its air quality index," says a senior official at CPCB, requesting anonymity. “But we are still looking for something that better captures Indian conditions." A study by Jay Shanker Pandey, a scientist at the National Environmental Engineering Research Institute in Nagpur, shows that the health risk posed by NO2 and SPM is 22.11 and 16.13 times more, respectively, than that of SO2. A 2002 study in the California Central Valley, and cited by the Supreme Court’s environmental pollution arm, or EPCA, says that every 10% increase in the level of PM2.5 (particulate matter of diameter less than or equal to 2.5 micron) was associated with a 4.1% increase in acute respiratory hospitalization. For people suffering from asthma, the adverse health impact is worse. According to Amit Varma, head of the physiology department at the All India Institute of Medical Sciences in New Delhi, there are 50 million asthma patients in India, of which about 900,000 are in the Capital alone. A 6 December study published in The New England Journal of Medicine, specifically investigated the link between asthma and diesel exhaust and said that diesel exhaust fumes on polluted streets have a measurable effect on people with asthma. Some 60 participants, all asthma patients, walked for two hours along Oxford Street in London where diesel vehicles dominate, and, on a separate occasion, through Hyde Park. Participants had significantly higher exposure to PM and NO2 on Oxford Street than in Hyde Park. Walking on Oxford Street affected the lung’s expansion and contraction. Many environmentalists have been quick to point to the Capital’s rising vehicle population, especially those operating on diesel, for its perceived air quality woes. Figures from the Delhi state transport authority suggest a near 350% rise in the number of vehicles in the National Capital Region, which includes Delhi and neighbouring areas in the bordering states of Uttar Pradesh and Haryana, from 800,000 in 1990 to 2.8 million in 2006. This figure is adjusted for the vehicles that were decommisioned because they were older than 15 years. Within this, the relative share of diesel vehicles has increased from a low 3% in 1990 to about 11% in 2006 or from about 25,000 to some 240,000 vehicles. Estimates of the relative share of diesel vehicles among cars range from 18% by industry lobby Society of Indian Automobile Manufacturers , or Siam, to 30% by environmentalists. “The number of vehicles are clearly on the rise, and if the Tata group launches a diesel variant of its Rs1 lakh car, pollution levels are going to be much worse," insists Narain, a claim that is vehemently disputed by those who say they are familiar with the Tata Motors Ltd’s much anticipated car, whose engine and other specifications are yet to be officially disclosed. Indeed, some scientists have a different view from that of Narain’s. Pramila Goyal at IIT Delhi’s Centre for Atmospheric Sciences says that the Capital’s natural meteorological conditions play a significant role in determining its SPM content. In a 2002 peer-reviewed publication Atmospheric Environment, she wrote that winter months show a sudden spike in SPM levels due to the winds blowing in from the Thar desert in Rajasthan. “That causes levels to jump almost 200%, and moreover a good number of industrial units and power plants are situated in the wind direction," she wrote. “All of these contribute to the high SPM levels over Delhi." In the same paper, Goyal wrote that vehicles contribute only 6.7% of the total SPM over Delhi, while power plants pitch in with a high 60.4%. This, however, is based on 1997 data, and Goyal now says she’s unsure on whether these trends have sustained. Just recently, the government has decided to dismantle the 247.5MW Indraprastha power station located in the heart of the Capital due to the rising pollution levels and the plant completing its life cycle. The government had deferred its earlier decisions to do so on account of severe power shortage in Delhi. “Since two new power stations coming up at Bawana (1,500MW) and Bamnauli (750MW) will be operational by 2010, the government has decided to go ahead and dismantle the project," says a senior Delhi government official on condition of anonymity. Interestingly, a diesel engine is more fuel efficient than a petrol one, which is why it’s able to keep CO levels low in the first place. This is because during the combustion, there is little or no residue of unburnt carbon particles, which react with air to produce CO. But at the same time, this process wears down the fuel injection system, resulting in generation of SPMs. “The tragedy is that while petrol engines have been tweaked and fitted with devices that either trap fine particles or additionally treat emissions from the engine, there’s no real push from government to develop such technologies for diesel engines," says a scientist with a government environment research lab, who didn’t wish to be identified. Most of India’s diesel vehicle engines are based on European standards and typically follow Euro emission norms, which trail behind emission norms in the US. For instance, US EPA norms have capped emission levels, irrespective of the type of engine that emits it. Bharat Stage I and II, the emission norms followed in India that are modelled on European emission norms, have different rules for petrol and diesel engines. Thus a Euro-II diesel engine, for instance, is allowed to emit far more NO2 than a similar capacity petrol engine. A recent study by the Automotive Research Association of India, or Arai, an autonomous body, says that a Euro-III diesel car emits 7.5 times more particulate matter and three times more NO2 than a similar petrol car. However, the same diesel car emits 1.5 times less carbon dioxide, the most pervasive of the greenhouse gases. Indeed, the diesel fleet’s relatively lesser contribution to global warming is a principal point of defence for the automobile industry. 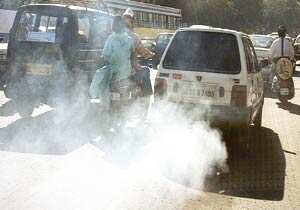 Though Tata Motors, which hasn’t officially responded to concerns about the environmental implications of their new car, the company’s managing director Ravi Kant, speaking at a recent forum of government, auto industry and environmentalists had said: “...the auto industry has always adhered to emission norms stipulated by the government but, at the same time, every emission requirement must keep pace with the available fuel technology too." For his part, Dilip Chenoy from auto lobby group Siam, blames the soaring construction in and around Delhi for the rise in particulate matter. “There’s the Metro being built...so many trucks carrying sand for this keep going in and out of the city, all these certainly hike increase the proportion of fine particles in the atmosphere," he says. Chenoy’s main worry is that if norms are put in too soon and without giving industry the time to adapt to it, “then nobody will gain anything". Though recent advances in diesel technology, such as diesel particulate filters, are available in the international market, they require so-called ultra clean diesel, which is currently defined as containing sulphur less than 10 parts per million (ppm). The Euro-III norms that are currently in force in 13 major cities of India use diesel with sulphur concentration ranging from 350 to 550ppm. Oil refineries say that without government help, the costs of refining diesel to those levels would be substantial. “I can’t give you figures, but it would be a big amount, which would ultimately have to be passed on to society," says R.K. Malhotra, research and development head at Indian Oil Corp. Ltd. Malhotra’s contention is that all blame can’t be passed on to oil companies simply because it’s government’s job to ensure that retrofit technologies, which are available internationally, be either bought or developed within the country and implemented. The continuous regenerative trap, said to be the cleanest and most effective device in diesel cars for checking particulate emissions, is the only device, according to Malhotra, that requires ultra clean diesel. Citing a study conducted by The Energy and Resurces Institute (Teri) and Arai conducted in 2006, he says that particulate filters were substantially able to bring down emissions even if diesel with sulphur concentration of 350-500ppm was used. But Delhi’s environment secretary J.K. Dadoo points to the sharp rise in vehicles on the city’s roads and says that even if such technologies were applied on a large scale, it just wouldn’t be enough. Meanwhile, city administrators, including chief minister Sheila Dikshit, continue to openly mull various ways, including a potential ban on diesel vehicles, as a way to keep its air clean.